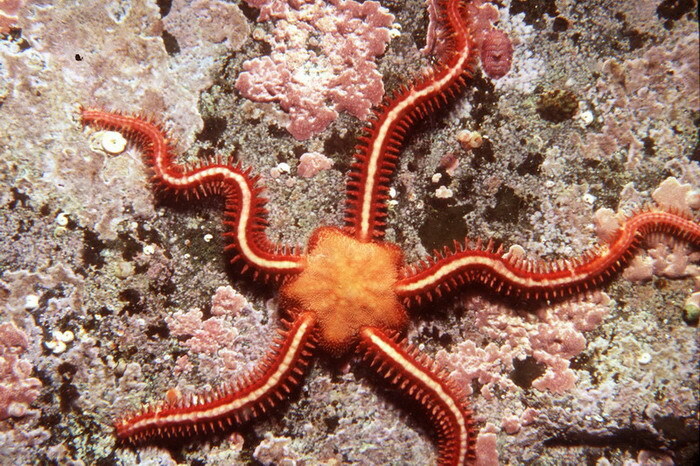 Brittle Stars are small sea creatures closely related to starfishes. They’re very primitive creatures – they can tell where’s up and where’s down, but as they have no brains, all their actions are reflexes. These sea inhabitants are very small, with their legs reaching a maximum length of 10 cm. The five legs connect in a round disc in the middle, in which all the organs are placed. Each of the legs is covered with small spikes with which plankton is caught and eaten. The Brittle Star’s mouth is located on one side of the disc. The skin of the disc is covered with lime crystals, making it considerably harder. The Brittle Star’s legs are not similar to the starfish’s meaty extremities – instead they’re hard, and highly animate growths, and they can regrow if lost. The feeding habits of this creature are also very primitive – the Brittle Star just waits for small parts of plankton to get stuck in the sticky ooze excreted by the stings on each leg. The food is then transported through small canals to the mouth. The best places for Brittle Stars to feed are sea bottoms near the shore, where the streams often deliver water rich with plankton. 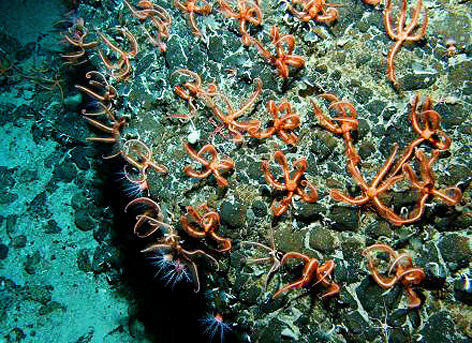 It’s not uncommon to see many thousands, even millions of Brittle Stars at one place, where the water is rich in food. As this creature’s body is made mostly of spikes and lime, it’s not a very popular prey for larger sea animals. Still, some fish that are starving will sometimes eat the Brittle Star in order to acquire even the tiniest amount of foodstuff. 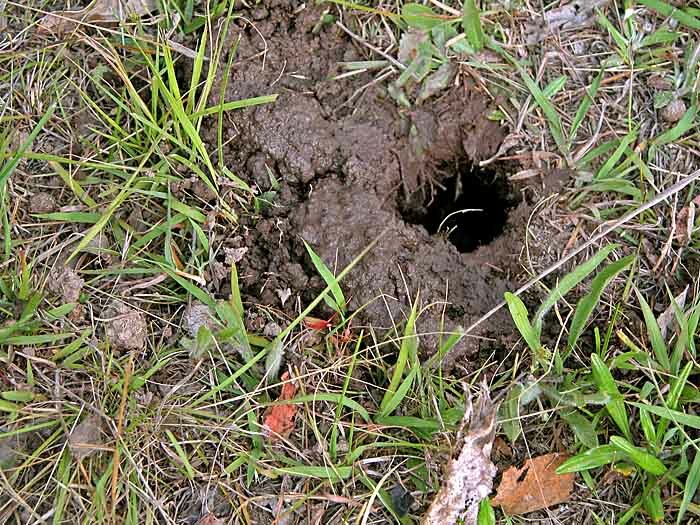 Having no material value, this species can also be relatively safe from humans and human population doesn’t cause direct damage to them. Warm water and plenty of food are the markers for the Brittle Star to mate. 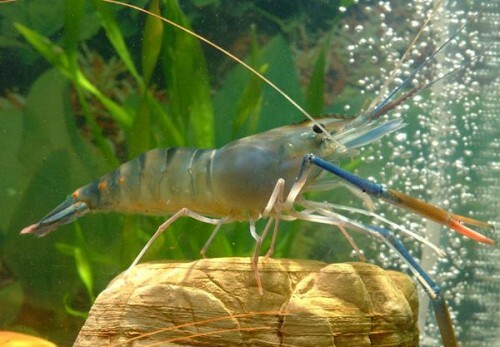 It’s interesting that these animals communicate with each other by using very complicated chemical signals. This ensures that both the sexes excrete their part of the mating fluid in the water at the same time. Fertilized eggs hatch into small larvae that hold absolutely no resemblance to the mature individuals, and they become part of the plankton itself . They go through multiple phases which can take quite a long time before becoming mature individuals. Although very primitive, the Brittle Stars are probably one of the most beautiful sea inhabitants and thankfully they’re not dangerous, as opposed to, for instance, the Clownfish. Brittle Stars can be seen at the sea shore after an ebb, although you should not try to pick them up – it would most often cause the animal to lose at least one leg, as they’re very fragile. Although one or two legs may be regrown, if the majority of them are lost, the Brittle Star is certain to die soon afterward.